The Singer 1+ One Plus 221-Stitch Computerized Sewing Machine is one of the more recent sewing machines to be developed by Singer. Although it is packed with features, it has been designed specifically for ease of use. Easy set up and great control over the type and speed of sewing all set over an extra-large sewing space for greater ease of access. All in all the Singer One Plus is a strong contender for being the best sewing machine for beginners. The Singer One Plus isn’t perfect, but it comes very close to perfection. The minor faults that I mentioned are very small in comparison to what you’ll find with other sewing machines and manufacturers. In terms of a complete computerized sewing machine for the everyday seamstress, this is perhaps the best I’ve ever tested. With this sewing machine Singer have really tried and succeeded to make advanced sewing accessible to even the most inexperienced sewing machine operators. A massive 231 built-in stitches are all selected via an easy to operate dial and a conveniently located LCD screen. Using the SwiftSmart threading system, those nightmares of trying to set up your new sewing machine are no longer. Effortless threading is achieved by guiding the thread to the needle and pressing the lever. Having a working area that is both spacious and well lit is something that many sewing machine manufacturers over the years have failed to prioritize. Not so with the Singer One Plus. The extra large sewing area, measuring nearly 15” in length makes tight working, especially for larger projects such as quilting, a lot easier. There is not really enough room to give full detail even in a comprehensive Singer One Plus review. A needle programmed to stop at the highest position. Avoid the need to raise the bobbin thread before sewing with a top drop-in bobbin system. High quality metal frame for increased durability. Three lamps are positioned to illuminate the working area for maximum light. The three most popular stitches are available at the touch of your fingertips. Great access to stitch cuffs and hems with a removable free arm. Automatic thread tensioning to ensure a consistent and stable quality of stitching. Automatic pressure by the presser foot on the fabric meaning that the sewing machine copes with lightweight and heavy fabrics just the same. Adjustable sewing speed up to 750 stitches per minute. Warranty: A limited 25 year warranty is provided allowing for 5 year electronic components cover and 1 year adjustments. Creating customized stitches is easy even for beginning sewers. Automatic needle threading is convenient. Large working space makes it easy to work on bigger projects. Adequate lighting for efficient sewing. Great selection of retro stitch designs. The instructional DVD that comes with the purchase is generic. LCD panel has low resolution. The foot pedal has to be unplugged to use the button for start or stop. 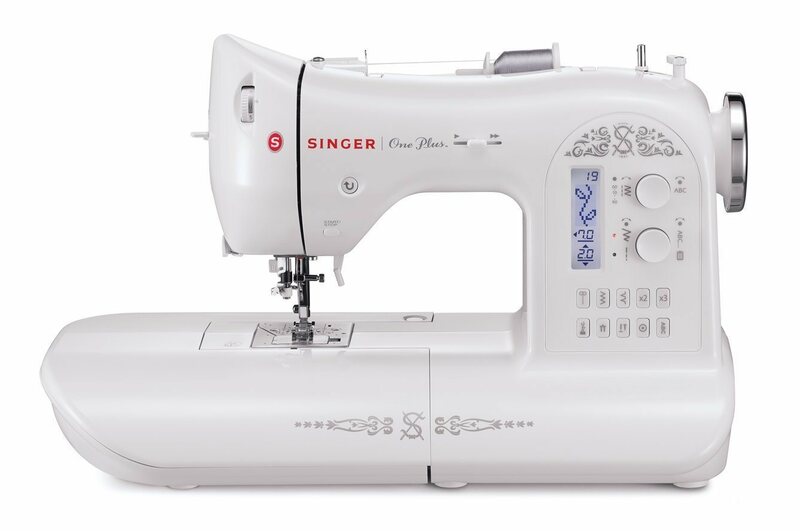 The Singer One Plus is a sophisticated and yet easily accessible sewing machine. With many desirable features. Not surprisingly it has proved popular with customers. At the time of writing this review there were over 100 customer reviews giving the sewing machine 4.4 stars out of a possible 5 stars. The vast majority of customers seem to really like the machine. “Can a person fall in love with a sewing machine? Can smooth stitching, whisper quiet operation, rows of tiny stitched heart, and automatically sized buttonholes bewitch a normal person?” said one delighted customer. Concerns offered seemed to relate to the lack of a quality manual and the ability to save programmed stitches. 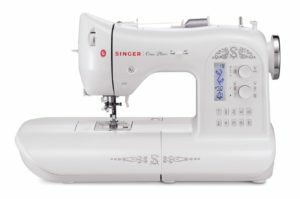 However, given Singer’s many years experience manufacturing high quality sewing machines and an excellent customer service offering, we have no concerns in give the Singer One Plus a strong recommendation. In summary, the Singer One Plus sewing machine should make using a sewing machine for everyday projects easy for even the most inexperienced person. The focus on ease of set up; high degree of pre-programming and large and comfortable working area make this a great sewing machine to choose.